Ultimate Cycler is like every other online networking business where members will need to get downlines before you can get a return. Ultimate Cycler was created 2011 by Peter Wolfing but due to the huge awareness of Nigerians in 2016 to online networking business, ponzi scheme, and peer to peer programs like MMM, Givers Forum, iCharity, Zarfund etc Ultimate Cycler has also gain the interest of Nigerians. In Ultimate Cycler members donate money to members meaning the system does not have a central account. The difference between Ultimate Cycler and other networking business or ponzi scheme is that in Ultimate Cycler money don't grow automatically unlike MMM and Givers forum etc where you will have to wait for 30 days for your money to be fully matured, In Ultimate Cycler you can get your investment and returns the same day you invested if you are active or register under an active team. Crediboo: The New Social Network That Pays. 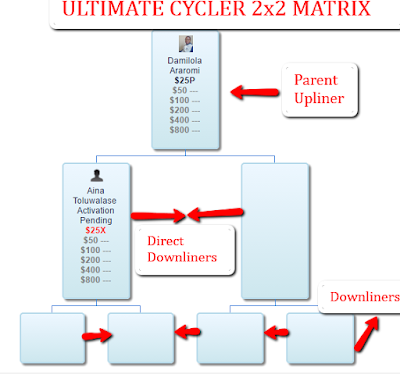 Ultimate Cycler is a 2x2 matrix system meaning when you register there must be two persons directly under you and each of the two persons will need two persons directly under them, making 6 persons in whole. For you to get fully paid your matrix must be complete, when two persons use your referral link they become your Direct Downliner as shown above these two persons will not pay you, any four persons that comes directly after these two persons either they use your Direct Downliner's referral link or your personal referral link they are your Downliners, they are the one to pay you. So, the difference in how Ultimately Cycler works to other scheme is that when you register under an active person or team, you don't need to get someone to use your referral link because Ultimate Cycler will automatically match the 6 persons under you. To register, You will need to use someone's referral link, this person becomes your direct upliner then the system will automatically match you to donate the sum of N12,500 ($25) to a qualified member either to the person you use his/her referral link or upliners, and he/she will then confirm your donation. Note: Make sure you register through an active person's referral link or better still you join an active group so that you can get both the investment and returns within a week. After successfully activating your account, login to your ultimate Cycler account, click on “My Profile”, when your profile loads up, scroll down to the part that says “Payment Instructions.” Delete the default text you don’t need them and enter your bank account details there. The system (Admin) will put 4 other registered people under you from spillovers who will also pay you N12,500 each, into your bank account, making N50,000 ($100). You can also bring people to register under you if you can’t wait for the system to do it for you. After you have completed your First Level (Matrix), you can now upgrade to Level 2, where you Will need to pay N25,000 from your N50000 to a Grade 2 upline member and now you don’t need to worry on how to get people in this level, the system will bring people under you. LEVEL 2: You upgrade with $50 (N25,000) out of your profits. As your downlines follow you, together with spillovers from your uplines, you cycle $50 x 4= $200 (N100,000). Re-enter as you did in the $25 matrix. You keep profiting with the cycle of $200 over and over without limit, giving you $150 each time you cycle, which is N75,000 net profit over and over and over again without end. LEVEL 3: It is also a 2×2 matrix. LEVEL 4: It is also a 2×2 matrix. LEVEL 5It is also a 2×2 matrix. STAGE 6: INVEST $800 (400,000) GET $3,200 (N1,600,000). You can equally join our whatsapp team Here we will guide you through the process.